I told my husband we were going to Curacao. "Curacao. You know, one of the ABC islands." "Curacao? Do they have blue water there?" Blue water indeed -lots of it. Curacao is located in the southwestern Caribbean, between Aruba and Bonaire (hence the "ABC Islands"), and is only 35 miles north of Venezuela. It was a trek getting to Curacao from the West Coast. Delta made it a bit easier with a direct flight from Atlanta, but East Coast cities are served well with connections on American through Miami. Our first view of Curacao was not encouraging. Very arid, the airport was surrounded by cacti and scrub brush. Not the tropical island I had envisioned. But Curacao grows on you. After a few days of acclimation, we looked beyond the busy streets and started to discover the real Curacao - home to empty beaches, abundant water life, and a mix of Dutch and Papiamentu that lead my daughter to shout "Bon Bini!" to everyone she encountered. Bon Bini means welcome in Papiamentu. 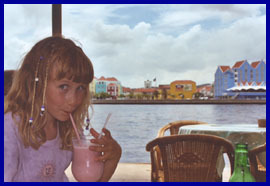 Curacao's Papiamentu is a Creole language - part Portuguese, English, Spanish and Dutch. It's on all the license plates, billboards and signs around the island - but I'll confess - not one person addressed us with a "Bon Bini!" - maybe next time. Curacao's slogan is "Real. Different." And that's apt - as the island is extremely different. The topography, the mix of Dutch and Caribbean influences, and the rustic, uninhabited expanses are intriguing. We found secluded beaches and incredible snorkeling spots. We found restaurants perched right on the sand that served delectable fresh fish and lobster. We found the contrast of Willemstad's historic buildings, with Ralph Lauren hues of gold, rust, turquoise, teal and lavender, against the Caribbean, looked like a painting or postcard. We found sections of Curacao to be as different as states in the U.S. - barren deserts, bustling cities, Riviera-like marinas, rustic dive beaches, trendy beachside cafes, pension-type hotels, and full scale-full service resorts. We also found a destination that works well for families. It's just the right mix of adventure, culture and history, but not too far from home. Families who like the blue water of the Caribbean, but want to feel like they never left North America, probably won't like Curacao. Even Europeans used to vacations in classy Manchester hotels and similar establishments may find it hard to appreciate the beauty of Curacao. It's just too different. And that's exactly what was so attractive to us. Sure, you can park it at a big resort for a week - eat some great food, go swimming, etc., but you'll miss out on all that Curacao has to offer. It's different - and it grows on you. As the time went by we became more comfortable with the island, exploring dirt roads and tiny cafes. We slowed down and absorbed the colors of Punda, shopping the Floating Market, watching the bridge slide open as huge tankers and cruise ships approached, and cooling off at a seaside café. We eased into the mixed language of Curacao. Dutch, English and Papiamentu - all three were represented on signs, menus and maps - challenging for the best of navigators. We ate well and often. Breezes' all-inclusive meals are perfect for families with a variety of tastes. But we ventured out as well. We loved the open-air waterfront restaurants that dot the island. Fresh fish, with a Creole flavor, went over big with this clan. But best of all, we reconnected as a family during our adventure. The "Bon Bini" came home with us - repackaged fresh, along with our bronzed bodies, collection of unique shells, and savored adventures. Curacao: different. For more see Destination: Curacao here. 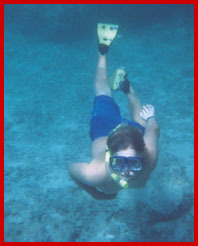 Or go directly to: www.curacao-tourism.com for more information.